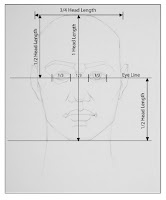 Today, I thought I'd cover the proportions of the head and offer some standard guides to help out with determining where to place the features of the head. 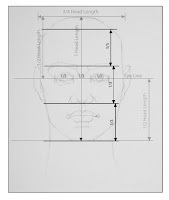 I will walk through some the proportional guides of head to create a better understanding of how the features fit on the head and how they relate to each other. Just like in the figure proportion post, I will be using the length of the head as a measurement for some of the proportions covered today. 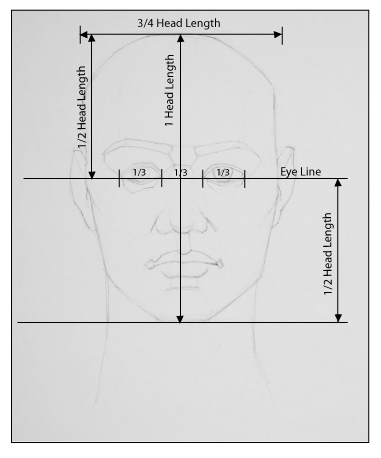 Lets look at the proportions of the head. 1. The head is 1 head length tall. 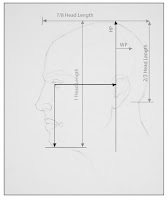 Seems obvious, but it is worth mentioning as this measurement will be used in relationship to other features of the head and to the whole figure. 2.The width of the head is 3/4 head length. 3. 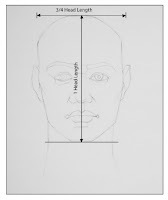 The depth of the head is 7/8 head length. 4. 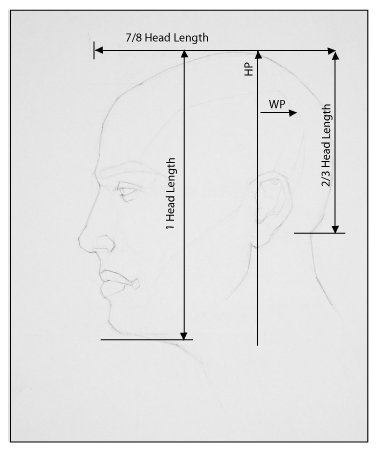 The height of cranium is 2/3 head length from the top of the skull to the bottom of the cranium. 5. The high point of the head lines up with the ear canal. 7. The jaw line starts just in front of the ear. 1. 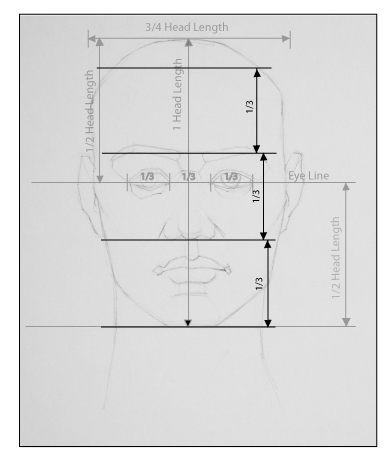 The eyes are 1/2 head length, they are halfway between the top and bottom of the head. 2. The distance between the eyes is equal to the length of one eye. 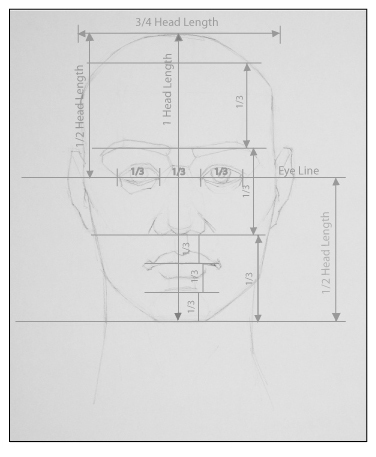 From the outermost edge of the left eye to the outermost edge of the right eye the distance will equal 3 eye lengths. 3. In profile, the eye rests well behind the ridge of the brow. Here we are looking for key feature locations with the space of the hairline and the bottom of the chin. We can divide this space into thirds. It is important to remember that we are not dividing the head in thirds here. 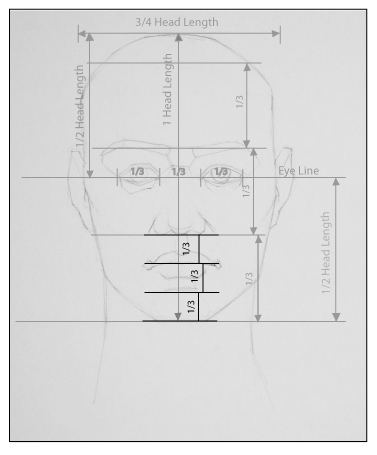 We are measuring from the hairline to the chin and dividing that space into thirds. 1. Hairline to brow line is 1/3. 2. Brow line to the bottom of the nose is 1/3. 3. Bottom of the nose to the bottom of the chin is 1/3. 1. 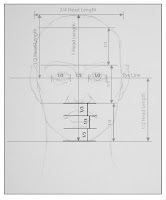 Divide the space between the bottom of the nose and the chin into thirds. 2. The center of the lips rests on the line at the bottom of the upper 1/3. Don't worry about the other mark dividing the area into to thirds. We don't use that mark for anything besides helping find the mouth. 1. The opening of the ear canal is just below the half way point of the head. 2. 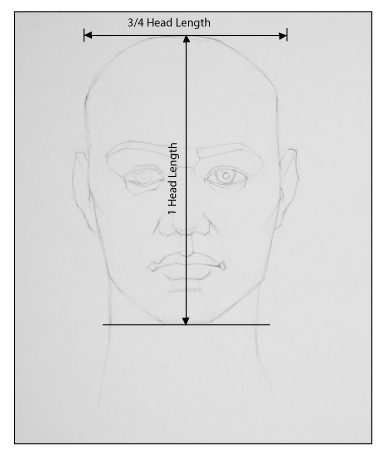 In profile, the distance from the tear duct to the opening of ear canal is the same distance as the tear duct to the chin. As I have mentioned with figure proportions, these proportions are just guidelines as the shape and size of the features will vary from person to person. Though, surprisingly, when it comes to placement of features there is a high level of uniformity between heads that may appear dramatically different. Still, keep in mind that there will be some variation from these guides as you look at the model. This all seems very technical but it doesn't have to take the fun out of drawing. Using and practicing these guides will make it easier to draw from life. 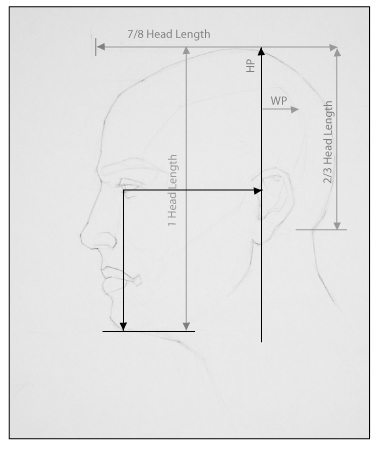 This head proportion page was very useful. I especially appreciated the "tear duct to the ear canal", this had never been poineted out to me, and I failed to discover it on my own! 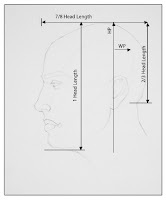 Best summary of head proportions I have seen. Summarizes what 10 years of painting and many different painting teachers have said. Well done! Great service to art students! Thank you sir! 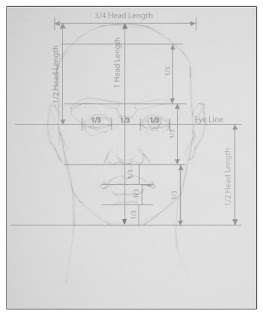 What is interesting is I have used this to measure some of the sketching I have been doing and everything that looks 'Right' follows these proportions and everything that looks like trash is outside of this by only a little bit.